Wood from a spruce tree displays the damage caused by beetles. The Roaring Fork Valley mostly dodged extensive tree mortality from mountain pine beetles, but other pests, such as the spruce beetle, pose a threat. The forest of the Roaring Fork Valley dodged the mountain pine beetle epidemic that turned much of Colorado’s mountain landscape brown, but it’s not out of the woods yet, so to speak. A comprehensive 2014 State of the Forest Report released Wednesday by the Aspen Center for Environmental Studies takes a careful inventory of what infestations and diseases are threatening which species of trees in the valley. It’s based on scientific data collected by the U.S. Forest Service and through field observations — not conjecture or hypothetical guesses. ACES undertook the study to educate laymen and public land managers about the issues and to create a model that other areas will be urged to follow. “In the world environmental crises, no one’s talking about forests until there’s a fire,” said ACES Executive Director Chris Lane. ACES and its partners want to change that lackadaisical approach to forest management with the report. “It’s hopefully a wake-up call,” Lane said. The report says the Roaring Fork Valley forest is relatively healthy because of its diversity of tree species. Other resort areas such as Vail, Breckenridge and Winter Park had an overwhelming amount of lodgepole pine trees. When the mountain pine beetle epidemic broke after drought weakened the trees’ defenses, their forests were hit hard. Needles on lodgepole pines turned brown and then gray over wide swaths of the landscape. In the Roaring Fork Valley, only 9.2 percent of the forest is lodgepole, and it’s so dispersed that it wasn’t easily reachable by pine beetles, the ACES report said. About 29 percent of the forest is aspen trees and another 29 percent is chokeberry, serviceberry and sage. The remainder is 20.3 percent spruce, 7 percent pinon-juniper and 5.6 percent cottonwood, Gambel oak and ponderosa. “When broken down into land cover types, it’s clear that no single forest type dominates our watershed — an asset that provides critical resiliency against specialized insects and diseases such as the spruce beetle,” the report said. That’s not to say the forest has gone unscathed from insect and disease damage. While the mountain pine beetle epidemic has weakened, there’s now a spruce beetle outbreak spreading in Colorado. Subalpine fir trees are getting hit even harder in the Roaring Fork Valley. 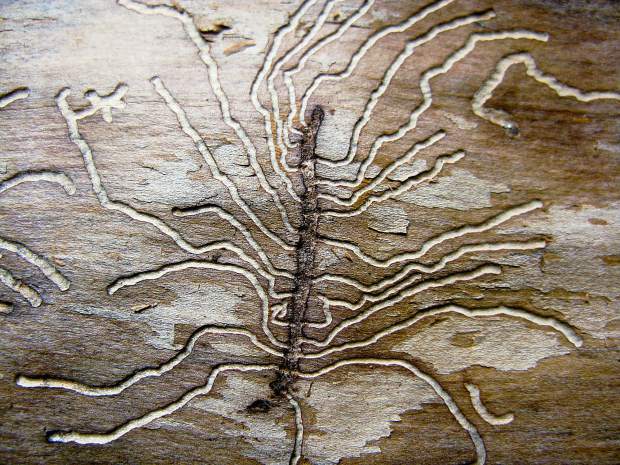 Root-disease fungi and western bark beetles are the biggest culprits. “Subalpine fir decline accounts for 86 percent of all tree deaths in the Roaring Fork Watershed in 2012,” the State of the Forest Report said. A chart shows that insects or disease damaged 16,000 acres of forest in the Roaring Fork Valley in 2012. That’s down from a peak of about 35,000 acres in 2008, when significant acres of aspen trees were hit by defoliations. The report also looks at factors affecting forest health. It looks at drought stress in the Roaring Fork Valley as well as high and low temperature patterns, precipitation and frost-free days. The number of subzero-degree days was down 50 percent in the upper valley last decade compared with 1940 to 1969, the report said. That lack of cold weather can lead to higher survival of beetle larvae over the winter. The number of frost-free days in Aspen mushroomed from an annual average of 76 from 1940 to 1969 to 113 from 2008 to 2012, the report said. The condition of the valley’s forest should be a fundamental concern for all residents, not just those who consider themselves conservationists, Lane said. About 69 percent of the acres in the valley — spanning Pitkin, Eagle and Garfield counties — are public lands or held in conservation easements. ACES is distributing 1,300 copies of the report to its members and hundreds more to public land managers, businesses and local, state and federal government officials. Allied conservation groups both in the valley and around the West will receive one and, hopefully, be inspired to create their own scorecard for their forests. Lane said the goal is to get the report where regular residents of the valley will see it. He wants copies sitting in dentists’ and doctors’ waiting rooms, for example. That way, ACES will be able to reach more than its regular choir. A digital version is available at http://www.aspen nature.org. “We’re going to aim big with this one and see where it goes,” Lane said. But assigning a grade for forests is only half the battle. ACES hopes the State of the Forest Report influences public land-management decisions and will coax lifestyle changes to help reduce stress and improve the health of forests. The report won’t be a one-and-done document that sits on a shelf and collects dust. ACES has worked with the University of Arizona to develop a Forest Index that will be applied regularly to check the condition of the Roaring Fork Valley forest. It has been peer-reviewed by six professors from six universities, according to Lane. ACES and public land managers will be able to follow the index to gauge what’s working and what isn’t and try to correct management or stay on a winning path.